One program that likely will address IU’s achievements as well as its shortcomings is the university marker program. University historian James Capshew said a committee has been formed to review nominations that can be submitted by anyone on IU’s bicentennial website, 200.iu.edu. “We’re looking for historic events and people and places where the university needs to pay attention to history,” he said. It’s hard to say what kind of response the committee will get, but Capshew said it will not shy away from placing markers that take a critical look at the university’s history, such as the protests that took place during a Little 500 bicycle race in the late 1960s. At that time, fraternity charters had policies that disallowed black students from joining. He said this protest could warrant a marker. “It’s a way to use the campus itself as a teaching tool,” he said. Capshew said the program will continue up to and after the university’s bicentennial anniversary in 2020. Bicentennial celebration director Kelly Kish said IU’s office for the vice president of capital planning and facilities will oversee the design of the markers, which will then be presented to the IU board of trustees for approval. Though the bicentennial steering committee has come up with its own projects, two grant programs will allow others to contribute to the celebration. One will provide money for faculty who want to create or revise courses related to the university’s bicentennial. The other will provide money for bicentennial programs proposed by students, faculty, staff and IU-affiliated groups, such as alumni chapters. In addition to the marker and grant programs, McRobbie announced the establishment of a public art restoration fund that will be supported, in part, by the estate of former IU President William Lowe Bryan. The Bryan Public Art Restoration Fund will be used to maintain public art on all IU campuses. 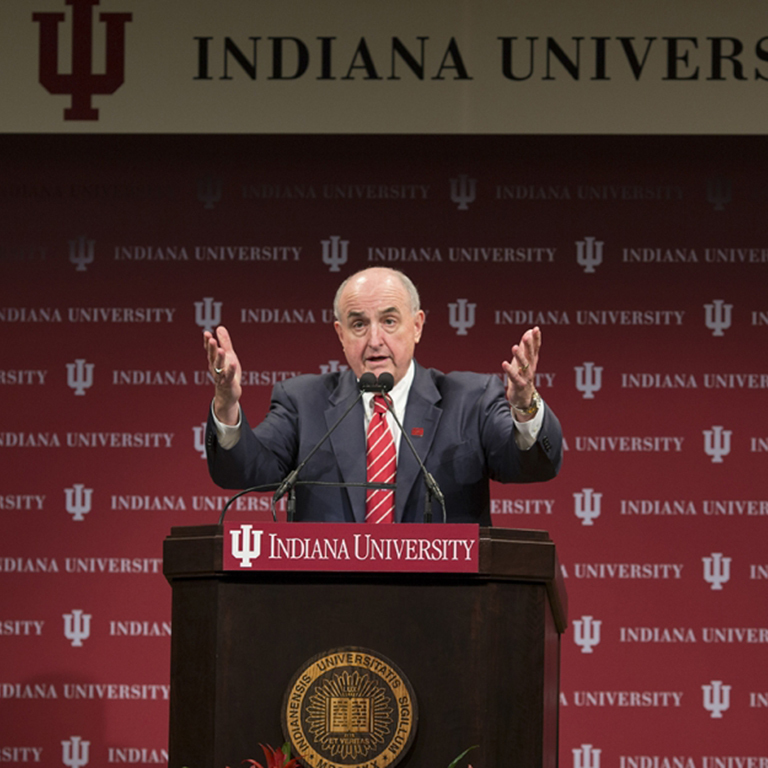 The fourth program McRobbie mentioned is the IU Bicentennial Oral History Project, which began in 2008. More than 400 interviews with alumni as well as current and former faculty and staff members already have been collected for the project aimed at filling in the gaps of the university’s written institutional records. “I ask you and your colleagues, and alumni around the world, to volunteer as an interviewee or as an interviewer to gather this crucial evidence of our collective past and present,” McRobbie said. Kish and Capshew will be visiting all IU campuses in the coming weeks for open houses on the major bicentennial projects. Kish said they’ll be on the Bloomington campus Oct. 5. More information about active and proposed projects can be found on IU’s bicentennial website. In addition to the bicentennial programs, McRobbie announced a plan to eliminate unnecessary administrative policies. Cate said the university is about research, teaching and service. Rebecca Spang, a history professor and president of the Bloomington Faculty Council, said she expects the faculty to welcome the idea. One area she said faculty in different parts of the university have found difficult to negotiate is policies on travel funding and reimbursement. For example, she said a faculty member might include a per diem living allowance in a grant proposal for a research trip to the Andes Mountains. However, they can’t get that per diem until they’ve completed their travel. “The reason that was put into the proposal is because they didn’t have the money to pay for that travel out of pocket,” she said. Cate said an email with more details about the working group and how to suggest policies to be reviewed will be sent out to faculty as early as today.